American architect Richard Morris Hunt (born October 31, 1827 in Brattleboro, Vermont) became famous for designing elaborate homes for the very wealthy. He worked on many different types of buildings, however, including libraries, civic buildings, apartment buildings, and art museums—providing the same elegant architecture for America's growing middle class as he was designing for America's nouveau riche. 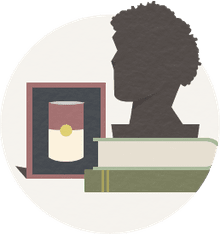 Within the architecture community, Hunt is credited with making architecture a profession by being a founding father of the American Institute of Architects (AIA). Richard Morris Hunt was born into a wealthy and prominent New England family. His grandfather had been Lieutenant Governor and a founding father of Vermont, and his father, Jonathan Hunt, was a United States Congressman. A decade after his father's 1832 death, the Hunts moved to Europe for an extended stay. The young Hunt traveled throughout Europe and studied for a time in Geneva, Switzerland. Hunt's older brother, William Morris Hunt, also studied in Europe and became a well-known portrait painter after returning to New England. The trajectory of the younger Hunt's life changed in 1846 when he became the first American to study at the esteemed École des Beaux-Arts in Paris, France. Hunt graduated from the school of fine arts and stayed on to become an assistant at the École in 1854. Under the mentorship of French architect Hector Lefuel, Richard Morris Hunt remained in Paris to work on expanding the great Louvre museum. When Hunt returned to the United States in 1855, he settled in New York, confident in introducing the country to what he had learned in France and had seen throughout his worldly travels. The 19th century mix of styles and ideas he brought to America is sometimes call Renaissance Revival, an expression of excitement for reviving historic forms. Hunt incorporated Western European designs, including the French Beaux Arts, into his own works. One of his first commissions in 1858 was the Tenth Street Studio Building at 51 West 10th Street in the area of New York City known as Greenwich Village. The design for artists' studios grouped around a skylighted communal gallery space was apropos to the building's function but thought to be too specific to be repurposed in the 20th century; the historic structure was torn down in 1956. New York City was Hunt's laboratory for new American architecture. In 1870 he built Stuyvesant Apartments, one of the first French-style, Mansard-roofed apartment houses for the American middle class. He experimented with cast-iron facades in the 1874 Roosevelt Building at 480 Broadway. The 1875 New York Tribune Building was not only one of the first NYC skyscrapers but also one of the first commercial buildings to use elevators. If all of these iconic buildings are not enough, Hunt also was called upon to design the pedestal for the Statue of Liberty, finished in 1886. Hunt's first Newport, Rhode Island residence was wooden and more sedate than the stone Newport mansions yet to be built. Taking chalet detailings from his time in Switzerland and the half-timbering he observed in his European travels, Hunt developed a modern Gothic or Gothic Revival home for John and Jane Griswold in 1864. Hunt's design of the Griswold House became known as Stick Style. Today the Griswold House is the Newport Art Museum. The 19th century was a time in American history when many businessmen became rich, amassed huge fortunes, and built opulent mansions gilt with gold. Several architects, including Richard Morris Hunt, became known as Gilded Age architects for designing palatial homes with lavish interiors. Working with artists and craftspeople, Hunt designed lavish interiors with paintings, sculptures, murals, and interior architectural details modeled after those found in European castles and palaces. His most famous grand mansions were for the Vanderbilts, sons of William Henry Vanderbilt and the grandsons of Cornelius Vanderbilt, known as the Commodore. In 1883 Hunt completed a New York City mansion called the Petite Chateau for William Kissam Vanderbilt (1849-1920) and his wife Alva. Hunt brought France to Fifth Avenue in New York City in an architectural expression that became known as Châteauesque. Their summer "cottage" in Newport, Rhode Island was a short hop from New York. Designed in a more Beaux Arts style, Marble House was designed as a temple and remains one of America's grand mansions. Not to be outdone by his brother, Cornelius Vanderbilt II (1843-1899) hired Richard Morris Hunt to replace a run-down wooden Newport structure with what became known as the Breakers. With its massive Corinthian columns, the solid-stone Breakers is supported with steel trusses and is as fire-resistant as possible for its day. Resembling a 16th-century Italian seaside palace, the mansion incorporates Beaux Arts and Victorian elements, including gilt cornices, rare marble, "wedding cake" painted ceilings, and prominent chimneys. Hunt modeled the Great Hall after the Renaissance-era Italian palazzos he encountered in Turin and Genoa, yet the Breakers is one of the first private residences to have electric lights and a private elevator. Architect Richard Morris Hunt gave Breakers Mansion grand spaces for entertaining. The mansion has a 45-foot high central Great Hall, arcades, many levels, and a covered, central courtyard. Many of the rooms and other architectural elements, decorations in French and Italian styles, were designed and constructed simultaneously and then shipped to the U.S.to be reassembled in the house. Hunt called this way of building a "Critical Path Method," which allowed the complicated mansion to be completed in 27 months. George Washington Vanderbilt II (1862-1914) hired Richard Morris Hunt to build the most elegant and largest private residence in America. 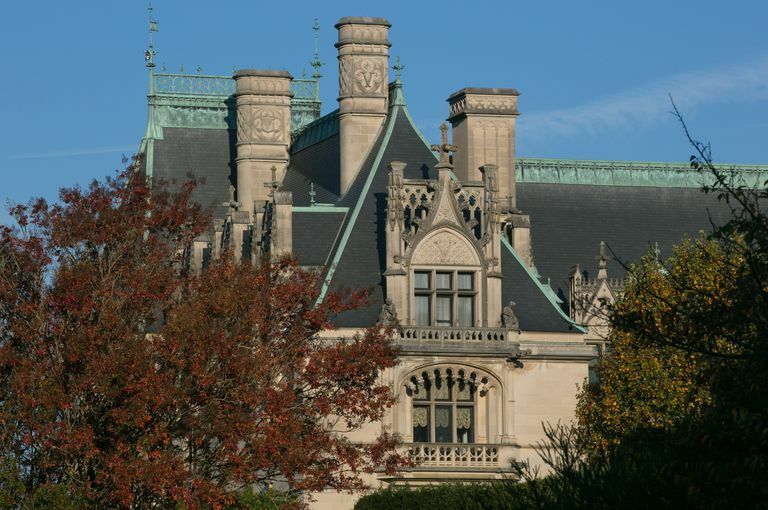 In the hills of Asheville, North Carolina, Biltmore Estate is America's 250-room French Renaissance chateau—a symbol of both the industrial wealth of the Vanderbilt family and the culmination of Richard Morris Hunt's training as an architect. The estate is a dynamic example of formal elegance surrounded by natural landscaping—Frederick Law Olmsted, known as the father of landscape architecture, designed the grounds. At the end of their careers, Hunt and Olmsted together designed not only Biltmore Estates but also nearby Biltmore Village, a community to house the many servants and caretakers employed by the Vanderbilts. Both the estate and the village are open to the public, and most people concur that the experience is not to be missed. Hunt was instrumental in establishing architecture as a profession in the U.S. He is often called the Dean of American architecture. Based on his own studies at École des Beaux-Arts, Hunt advocated the notion that American architects should be formally trained in history and the fine arts. He started the first American studio for architect training—right in his own studio as the Tenth Street Studio Building in New York City. Most importantly, Richard Morris Hunt helped found the American Institute of Architects in 1857 and served as the professional organization's president from 1888 until 1891. He was a mentor to two titans of American architecture, Philadelphia architect Frank Furness (1839-1912) and New York City-born George B. Post (1837-1913). Later in life, even after designing the Statue of Liberty's pedestal, Hunt continued to design high-profile civic projects. Hunt was the architect of two buildings at the United States Military Academy at West Point, the 1893 Gymnasium and an 1895 academic building. Some say Hunt's overall masterpiece, however, may have been the 1893 Columbian Exposition Administration Building, for a world's fair whose buildings are long since gone from Jackson Park in Chicago, Illinois. At the time of his death on July 31, 1895 in Newport, Rhode Island, Hunt was working on the entrance to the Metropolitan Museum in New York City. Art and architecture were in Hunt's blood.